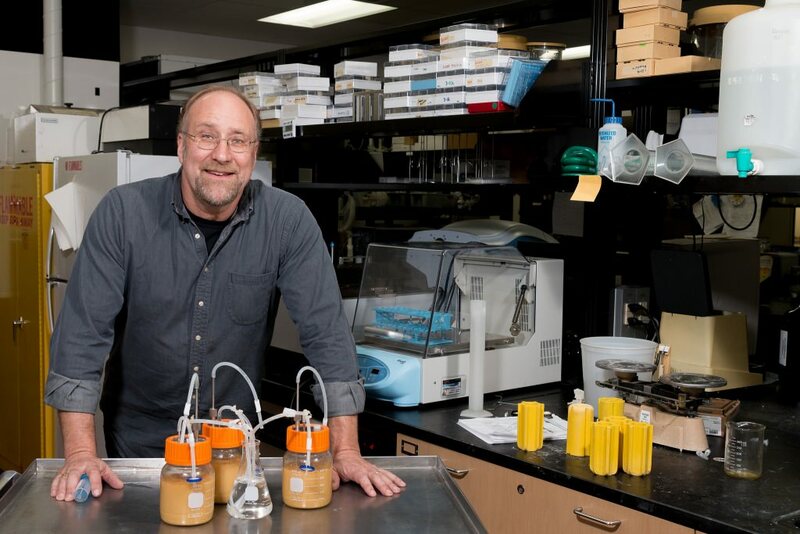 Steele, the University of Wisconsin–Madison Winder-Bascom professor of food science, specializes in food, beverage and biofuel fermentation. Understanding how bacteria and yeast convert biomass into products has been his stock-in-trade for more than 30 years. The fermentation of beer and wine can be plagued by contamination with lactic acid bacteria, which make lactic acid rather than alcohol. The same problem affects the ethanol industry. Steele’s new company, Lactic Solutions, is advancing a judo-like remedy: using genetic engineering to transform enemy into friend. Instead of killing lactic acid bacteria with antibiotics, he’s spliced in genes for ethanol production so these organisms produce ethanol, not lactic acid. “We are taking the problem and trying to turn it into a solution,” Steele says. The company will sell bags of bacteria to the ethanol industry to be added to the fermenter alongside the yeast that presently makes ethanol. About 70 percent of ethanol plants fight lactic acid bacteria with antibiotics, including erythromycin, virginiamycin and penicillin. But these and other life-saving drugs are the subject of frantic concern as bacteria evolve resistance to one antibiotic after another. The result could be dangerous drugs — or dangerous bugs — in the human food supply. Like the beer industry, some ethanol plants use hops to control lactic acid bacteria, but that’s more expensive and less effective than antibiotics. As an ecologist of the microbial realm, Steele recognizes that the engineered bacteria must reproduce and survive rising levels of ethanol in the fermenter. To give them a competitive edge, a large number of engineered bacteria will be introduced as early as possible. Steele’s new company is advancing a judo-like remedy: using genetic engineering to transform enemy into friend. Steele’s patent, assigned to the Wisconsin Alumni Research Foundation, covers his concept for altering lactic acid bacteria to fight competing bacteria and to make ethanol, based on unused sugars. As a legacy of Wisconsin’s leadership in the cheese industry, the state has two of the world’s largest producers of lactic acid bacteria. Lactic Solutions will outsource manufacturing and distribution and focus on providing service to customers and developing new strains.